Starts to relieve cravings in just 30 seconds to help you quit smoking for good. Acts fast on nicotine cravings to help smokers quit. Suitable for all smokers regardless of the number of cigarettes they smoke. 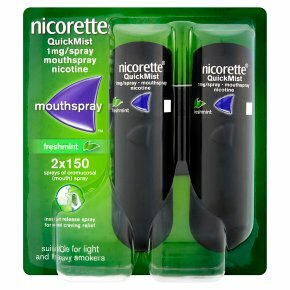 To help you quit smoking for good.Use: Nicorette® QuickMist is used to relieve and/or prevent withdrawal symptoms and reduce the cravings you get when you try to stop smoking or when cutting down the number of cigarettes you smoke. It provides a safer alternative to smoking for both the individual and those around them. Ideally you should aim to stop smoking. However it can be used in a number of different ways, either to completely replace all your cigarettes, or if you do not feel ready to stop smoking completely, to replace certain cigarettes and therefore help you to cut down the number of cigarettes you smoke. It may also help increase your motivation to quit. Directions: For adults and children 12 years and over. It is important to use enough nicotine spray to control cravings, and using 1 or 2 sprays corresponds to the nicotine from a cigarette. Use one spray first and if your cravings do not disappear within a few minutes use a second spray. If 2 sprays are required to control cravings, future doses may be delivered as 2 consecutive sprays. For many smokers this means about 1-2 sprays every 30 minutes to 1 hour. Do not use more than 2 sprays per dose or 4 sprays per hour or 64 sprays per day. Before use, please read the information leaflet carefully. You are more likely to quit smoking when using this product with help from your pharmacist, doctor, a trained counsellor or a support programme. Please read the enclosed leaflet for instructions. Warning: Do not take more medicine than the label tells you to.<br>If you are pregnant, talk to your doctor, pharmacist or nurse for advice before using this product. If you need any advice before starting to use this product, talk to your doctor, pharmacist or nurse. May initially cause mouth and throat irritation. Do not use if you are allergic to any of the ingredients listed below. Contains ethanol.<br><br>Keep out of the sight and reach of children.